This is the first year we've opened an "official" call for volunteers. If you've volunteered or been on staff in the past, even if you've already spoken to one of us this year, please take a second and complete the form! We're mainly doing this to create a list of people and do a better job at organizing resources this year! Fill out the form completely so that we can keep you in the loop. We'll be using some new tools to communicate and schedule positions and shifts this year so we need this information to do that! We'll do our best to get you in the shifts and positions you prefer. Also, as this is a smaller CON, its unlikely you'll miss a talk you want to see, but you'll have the chance to "accept" the slots you work. Get your response in early so you get first dibs at the slots you want! 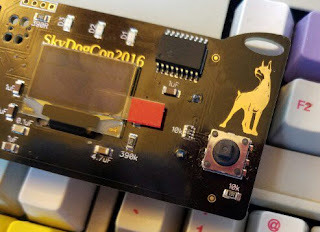 Also this year, similar to other conferences, we're putting in a "threshold" of time to earn a SkyDogCon badge. No more, "come do 1 x 4hour shift and snag a free badge" this year! You know who you are...you are forgiven, but not this year! The terms are subject to change, but plan on scheduling (and working) at least 12 hours in order to earn your badge. Lastly, if you're interested in sharing a room to reduce cost, please indicate it on the form and we'll do our best to link you up with other staff/volunteers who would like to share as well.